The Apple iPhone 6s and Apple iPhone 6s Plus have already been on sale in Sydney, Australia. The city is traditionally one of the first to have the iPhone on sale each year. While lines were long as usual around the Apple Store in the city, a fierce rain storm made the conditions even rougher for those waiting to purchase the new handsets. The line was led by Lindsay Handmer who says that he is not an Apple fan. Still, he was possessed to wait in line for two days as a way to promote his business, and raise money for charity. Handmer will later auction off the two iPhones he buys today, with the proceeds going to charity. 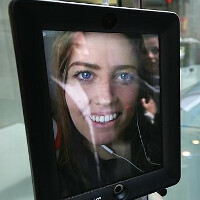 A woman named Lucy Kelly had her place on line held by a "telepresence robot" made up of an internet-connected iPad on top of a base station. With the robot holding on to her place in line at the Apple Store, Lucy was able to go to work on Thursday, and still pick up her new iPhone on Friday. The iPhone 6s and iPhone 6s Plus are built this year using a stronger Series 7000 aluminum. The material, employed on the Apple Watch, is used in aerospace production and should eliminate the bending that took place last year. In addition, 3D Touch allows the screen to differentiate between a light, regular, and hard tap. This allows users to "peak" and "pop." Press lightly to get a peak at content, press harder to pop into the content. On the home screen, 3D Touch brings you short cuts, and also works inside apps to give you different options. Other changes include the new 12MP rear-facing camera and the 5MP FaceTime shooter, up from 8MP and 1.5MP respectively. There is a new A9 chipset inside the device, RAM has been doubled to 2GB, and the new Rose Gold color has been extremely popular. Last year, Apple sold 10 million Apple iPhone 6 and Apple iPhone 6 Plus units during the launch weekend. Based on pre-order demand, it looks like this is one record that will be broken this weekend. I'm first in line at my local AT&T. I want the silver, but will take gold or space gray. How about you? It's between silver and space gray for me. I hope they release a black front like they did with the 5c. That would look great. I've seen that one on YouTube. Black front, gray back right? Yeah. I don't even have my 6S yet and I'm counting down the days until the 7 comes out, lol. I wonder what design changes will be there. I hope they get rid of the big bezels. At least trim the top ones. Ohh those horrible oversized beezles. Same i can't wait to see if they reduce them in the 7. IIRC, the reason for that is that they want to keep the top and bottom bezels the same for a more symmetrical look. And since they can't trim the bottom bezel as well due to the physical home button, that's how it is. There were reports of them making the home button part of the screen (as in a non physical button but a touch one) and IIRC the problem was incorporating Touch ID into it as well. But until that happens I expect they'll keep the larger top bezel. People has to grow up. Being on a tech site and still don't know how to get one without sweat is ridiculous. Apple opening customer line: Weirdest sh*t ever. That wouldn't last one night in America without being either stolen or torn apart. It reminded me of this. http://www.usatoday.com/story/news/nation-now/2015/08/03/hitchhiking-robot-destroyed-philadelphia-ending-cross-country-trek/31051589/ I don't know why SOME Americans have an IQ of almost 10-0. It's as worse as voting for Donald Trump. Anyway: No to DONALD TRUMP. I thought that turned out to be a hoax. I forget why they did it tho. Yes! I was thinking exactly of that story, pretty messed up. I wish that woman luck in getting a iPhone and that robot back safely. These comments about America make us Americans debate voting for Trump just out of spite. Man this is kinda creepy.. well at least to me anyway haha. These iSheep are getting desperate. I never got on any line to get a new phone! And guess what? I've the best phone ever with me right now: Note 4!